From the 9th to the 13th of November, TRADERS will host its second international Autumn School: “ON THE ROLE OF PARTICIPATORY ART AND DESIGN IN THE RECONFIGURATION OF WORK (IN GENK)”. HERE you can view / download the final program of the week (of which applicants selected from a public call will take part). Besides the full program, there will be a public program of lectures during the first three days (see poster above). Attendance to the lectures is free, but registration is required. 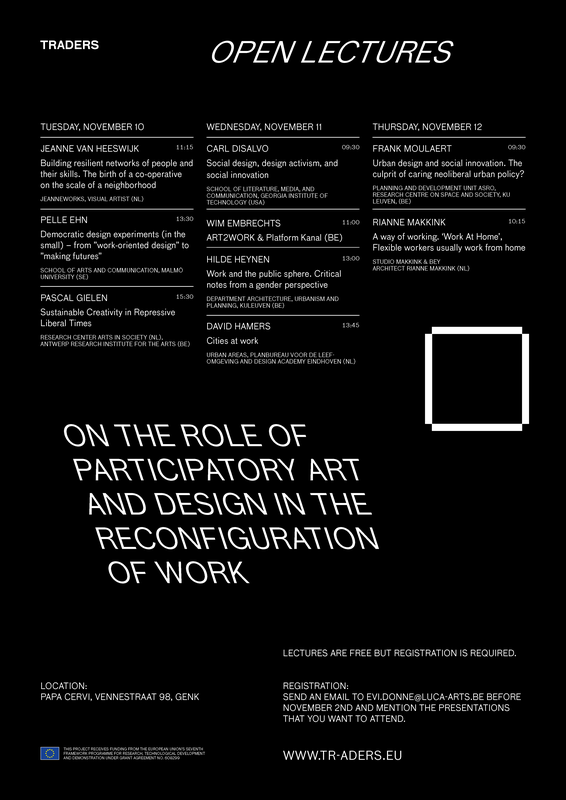 Send an e-mail to evi.donne@luca-arts.be before November the 2nd and mention the lectures you wish to attend.